Before we get started just let me make it SUPER clear that I love me some pasta. I love it tossed with some butter and parmesan, I love it covered in a thick meaty sauce, I love it layered between things and baked till bubbly and tender. 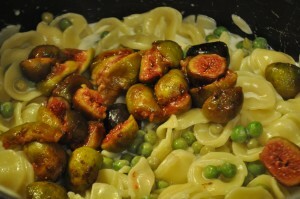 But sometimes you need to swap something in place of the pasta, both for health reasons and just to mix up flavors a little bit. Or this delicious combination of fresh figs, mascarpone, and peas! 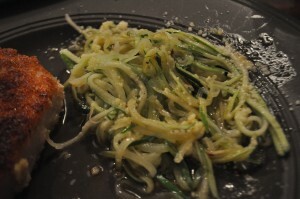 My friend Jen recently introduced me to using a julienne tool to turn a zucchini into “noodles”. This is a great, and super easy, way to add some veggies to your regular pasta if cooking for someone who proclaims they do not like veggies. The other night I had two zucchinis in the fridge on the verge of going bad so I decided to make them as the pasta themselves. After julienneing up the zucchini I tossed two whole garlic cloves into a pan with about 1/4 cup of oil and added 1 tablespoon of red pepper flakes. I cooked all of that over medium heat until the garlic cloves had browned, then pulled them out (and ate them, ovbs) then added the zucchini and tossed to coat it in the sauce. Then I tossed in 1/4 cup of parmesan and served it up with a quick grind of fresh pepper. The zucchini was crunch and sweet while the olive oil and cheese made it decadent. In another case of using up veggies before they go bad happened last weekend, after scoring the last of the heirloom tomatoes of the season (le sad) and some delightful green beans for which I had no idea what to do with them. The only thing I wanted to do with the tomatoes was slow roast them and then roll around in their juicy, rich goodness, which sadly was not an option. 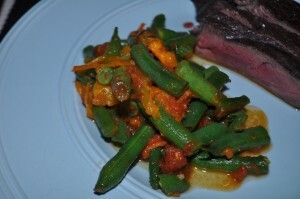 Instead I roasted them following Smitten Kitchen’s method then I cut the green beans into bite sized pieces and steamed them and tossed the beans and tomatoes together. After a quick topping of parmesan, which I use in recipes in place of salt most of the time, the dish was ready to be served. Do you guys have any tricks for swapping out pasta or rice?